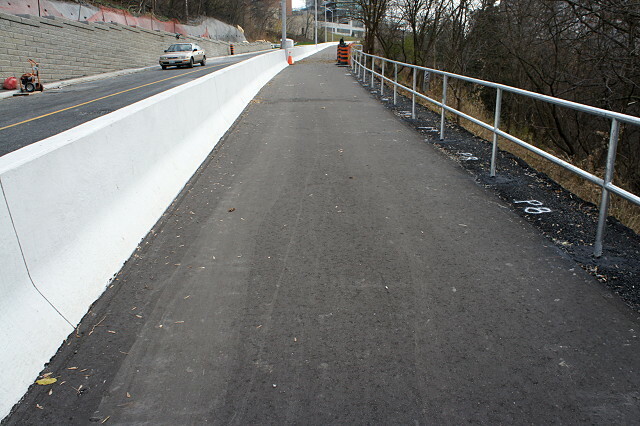 Holes for new bollards were cut into the middle of the asphalt ripple pattern on the Lower Don trail. 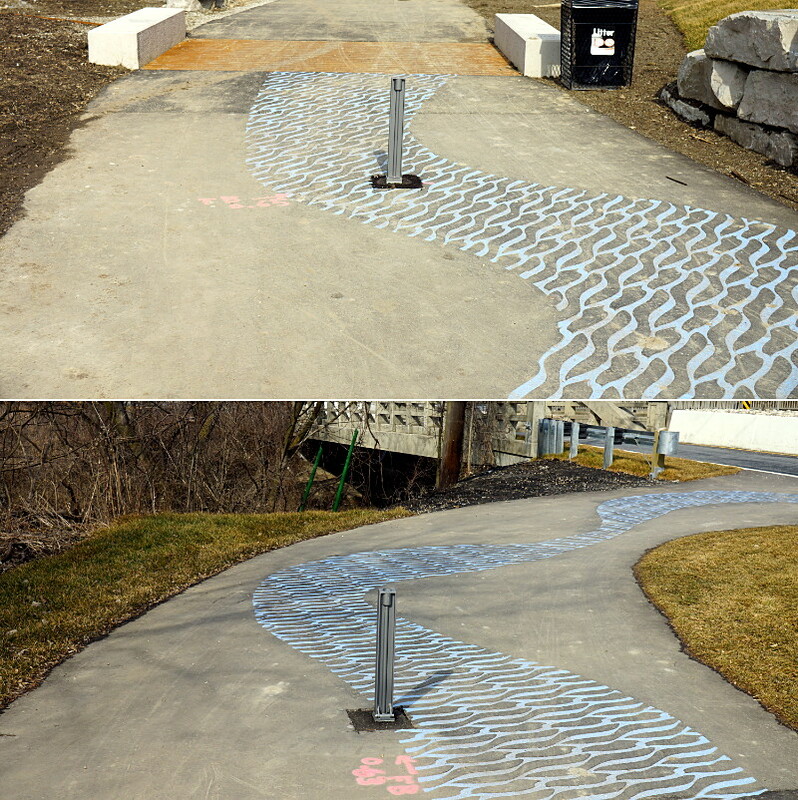 Less than two months after the upgraded Pottery Road crossing of the Lower Don trail was officially opened to a single rave review (as far as I know, I’m the only one who cared enough to review it), the city had already taken a knife to the artistic blue asphalt ripples to install a couple of bollards to prevent unauthorized vehicular access to the mixed-use path. I don’t have a problem with the bollards themselves, but would it have killed the installation crew to move them forward or backward a couple of feet and place them on the plain black asphalt instead of cutting into the middle of the embedded pattern? And did they have to make the same poor placement choice on the paths on both the north and south sides of Pottery Road? Anticipating the need for bollards during the main work would have allowed them to be installed without having to cut an ugly square patch out of freshly laid asphalt. Even looking at it now, I’m not really sure why the cuts were necessary. This is such a small detail in the context of the much larger Pottery Road reconstruction that it probably didn’t merit any specific design other than someone jabbing a finger at a drawing roughly where each bollard should go and someone else going down to Bollards R Us to pick up a pair of the current preferred model. I can’t imagine that there was any real requirement to place the bollards exactly where they did, nor that moving them a little bit would create a problem of any kind or cause them to be any less effective. So if there are no drawbacks, why wouldn’t you install them in a way that doesn’t degrade something unique that’s already there? And while this particular incident isn’t really worth getting too worked up about, the carelessness shown here is depressing only because it’s so endemic to public works in Toronto that overcoming it seems impossible. 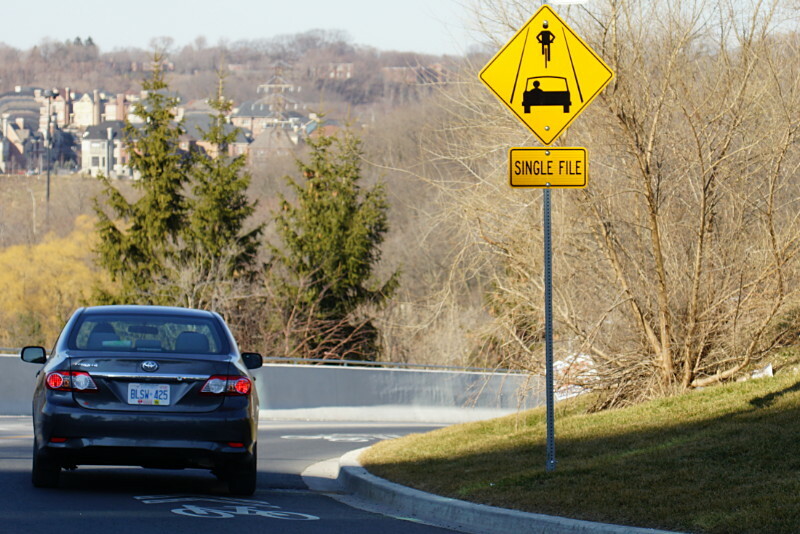 I noticed this newly installed sign at the top of Pottery Road today, where it should clear up any confusion drivers may have about whether they’re driving in a bike lane when they see those sharrows. There’s another one close to the bottom of the hill. I hope this can be the end of the controversy over these sharrows. 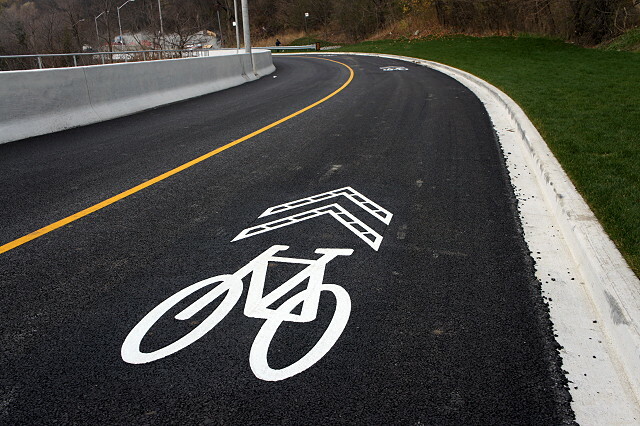 When Pottery Road re-opened at the end of November, cyclists and pedestrians rejoiced. So did drivers, but their joy was a little tempered. 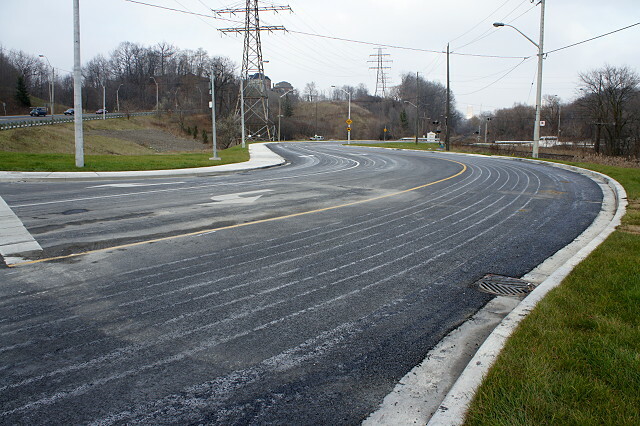 As a cyclist, I have nothing but praise (well, almost nothing but praise) for the outcome of the project, but I’ve heard a lot of complaints from drivers. Their concerns fall into two broad categories: why are these new traffic lanes so narrow, and what the hell are these bike symbols in the middle of the road? I first heard the former complaint from Risa, who drives down Pottery Road to work every day. I’ve since heard it from numerous others too. The latter complaint first came to the attention of Ward 29 Bikes via an email from a police officer who was recommending that the sharrows be removed because they confused motorists and encouraged cyclists to ride down the hill in the middle of the lane (which is kind of the whole point of them). He went on to explain that some motorists thought the sharrows indicated that they were driving in a bike lane. To get out of this supposed bike lane, they tried to do u-turns on the hill. I thought that was a joke when I first heard it, or at least an exaggeration to make some kind of anti-bike point. But after I heard the same thing elsewhere, I thought there might be a grain of truth in there after all. My first instinct is always to cast aside such tales as just part of the general grumpiness that accompanies any cycling infrastructure in this town. But after giving it some thought, I realized that drivers probably do have a legitimate problem with sharrows: they have no idea what a sharrow is. Although sharrows are explained over and over again on the city’s cycling website, in the city’s cycling newsletters, and at public meetings about cycling infrastructure, those audiences always consist of cyclists. I couldn’t recall sharrows ever being explained to drivers. Explanations aren’t included when you renew your licence, there are no explanatory signs beside the road, and no one holds public meetings explaining new cycling infrastructure to motorists. Whenever a new stop sign or traffic light appears, a big “NEW” sign is placed somewhere in the block leading up to it. 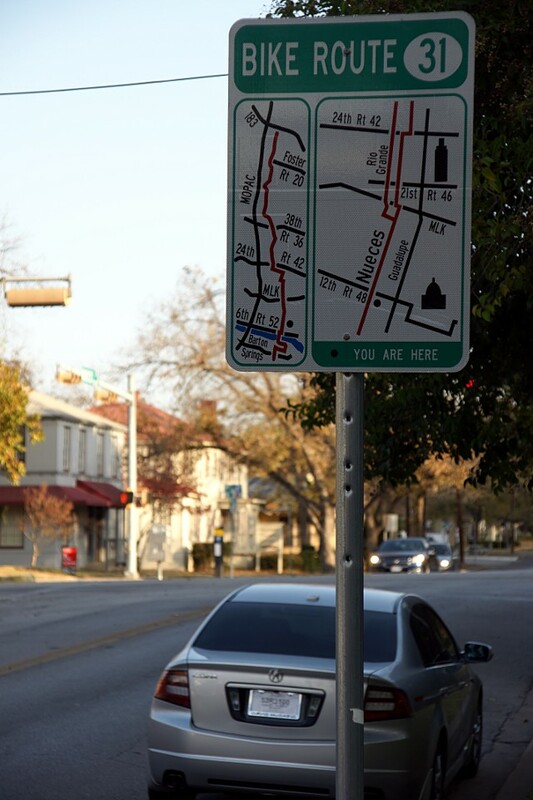 Bike lanes, HOV lanes, bus lanes, turning lanes, crosswalks, and even parking spots all come with accompanying overhead or roadside signs. In contrast, sharrows just appear out of nowhere without any explanation. That may be fine on streets like Wellesley where they form short connectors near intersections between sections of the bike lanes, but there is no similar context on Pottery Road, where they appear mysteriously at the top of the hill and disappear just as enigmatically at the bottom of the hill. When you’re inside the bubble of cycling information, it’s easy to forget that the memo was never really sent to the general public. Unless you are relatively active in the cycling community or visit www.toronto.ca/cycling once in a while, you probably have no idea what a sharrow is or what it’s supposed to indicate. What’s needed here is driver education, not removal of the sharrows. Fortunately, as reported on OpenFile last week, the city will be putting up signs in the spring explaining the shared lane markings. As for the narrow lanes, having driven up and down Pottery Road a few times myself, I agree that the lanes are narrower than they used to be. 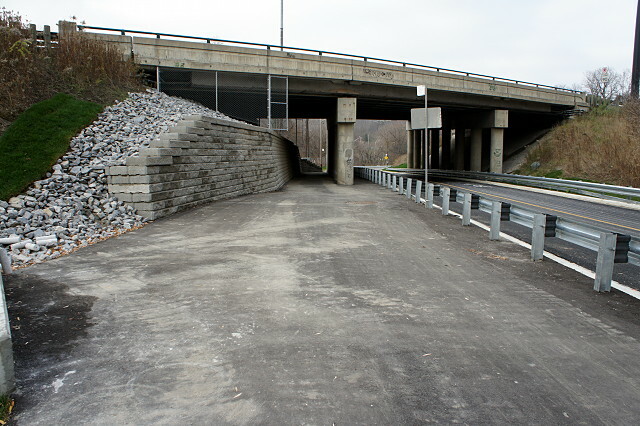 I could even be convinced to admit that I may feel a little crowded sharing the road with oncoming traffic between the retaining wall on one side and Jersey barrier on the other. And you know what? I don’t really have a problem with that. The lanes are still more than wide enough for cars and trucks to find their way up and down the hill. Studies say that narrowing lanes causes car drivers to slow down and I don’t have a problem with that, either. Speaking as a cyclist, pedestrian, and driver, anything that makes other drivers slow down a bit and think about driving safely is the kind of road improvement we need to see more often. 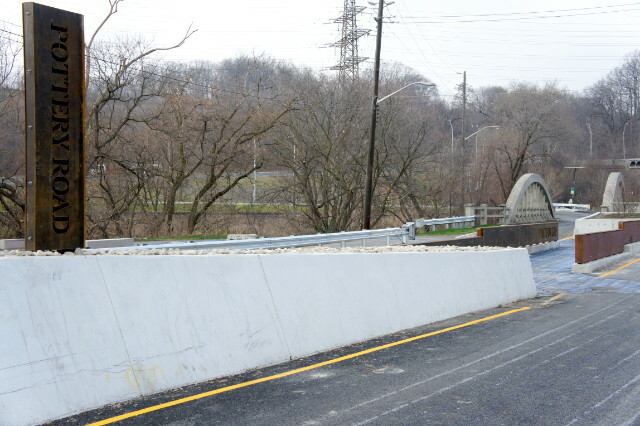 In case it wasn’t obvious from my previous two posts about Pottery Road, I should say again that I quite like all of the improvements that the reconstruction project has brought to this important connector. 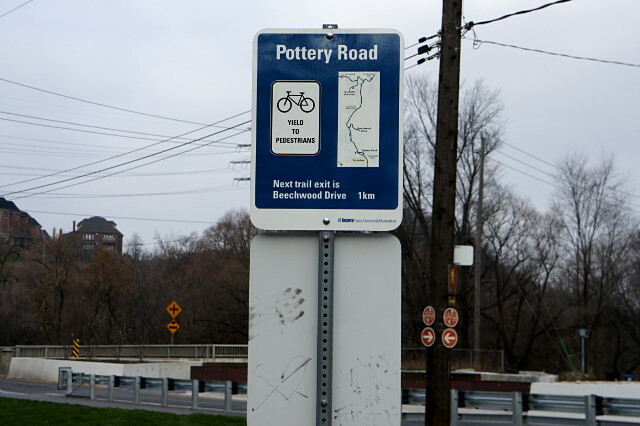 Pottery Road is a historic oddity, one of a small handful of roads that lead directly to the floor of the Don Valley and provide connections to all of the parks, infrastructure, and attractions down there. The only other road access nearby is via Beechwood Drive, which also used to lead to a paper mill. Although car drivers can access alternative routes easily enough, the options for pedestrians and cyclists are too far away to be practical in many cases. So even though Pottery Road has been an absolutely miserable route for pedestrians and cyclists for as long as I can remember, we’ve continued to use it regularly. So with all the good news covered in my previous posts, what’s the bad news? The main problem with the improvements is that they don’t go far enough. Literally. 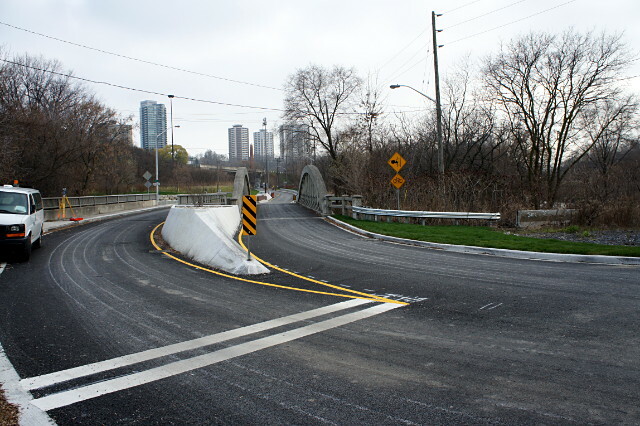 All of the improved cycling infrastructure and signage ends on the east side of the Don River, with no provision for cyclists between the Lower Don trail and Bayview Avenue. 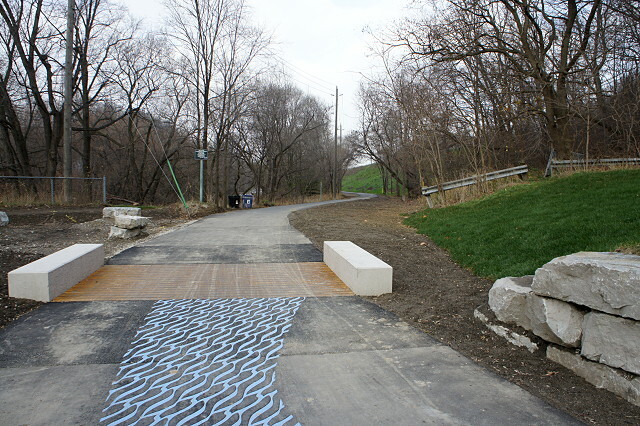 The new cycling facility gets cyclists as far as the trail, but leaves them on their own if they want to continue across the Don River to the Crothers’ Woods trailhead or to Bayview to ride down to the Brick Works or beyond. There were two main constraints on taking the cycling infrastructure across the river as part of this project. The first is that there’s no room to add separate bike lanes across the bridges, and no money in the budget to continue the trail onto a dedicated pedestrian and cyclist bridge across the river. 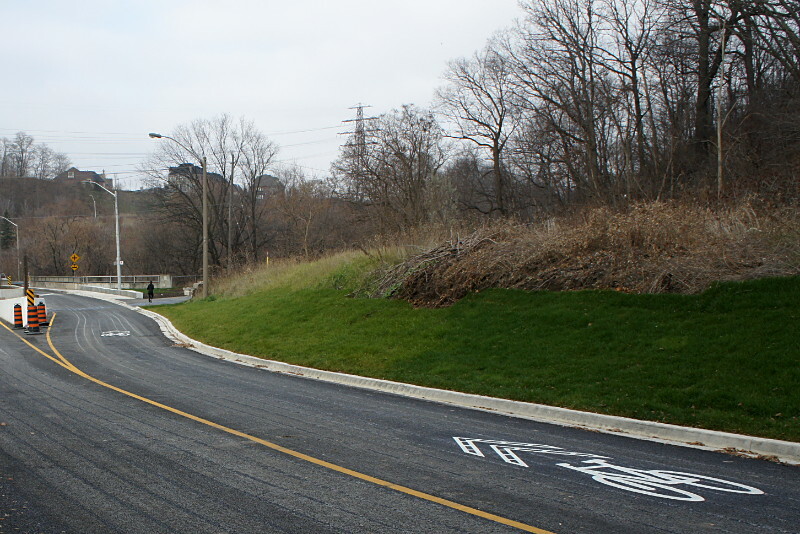 The second is that the cycling improvements on Pottery Road and at the Lower Don trail were a side-effect of the larger project; although cycling infrastructure was improved, it wasn’t the primary reason for the project. 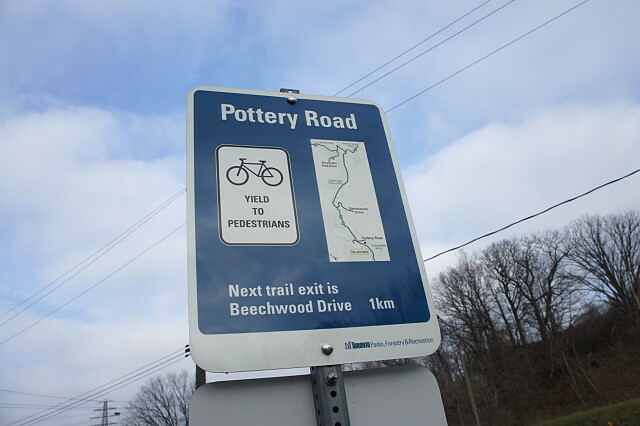 In fact, one city staffer told Ward 29 Bikes that they didn’t really consider Pottery Road to be a viable bike route and they’d rather cyclists use Beechwood Drive to get into the valley. Fortunately, cycling staff was able to get a lot accomplished against what seemed like a fair bit of push back. But despite that, I don’t see why, for example, the sharrows couldn’t have continued at least across the westbound bridge and been painted coming up from Bayview and across the eastbound bridge until a cyclist could get onto the separated path. This would have required a maximum of eight more sharrows to be painted on the road which, frankly, I can’t see as having any financial impact on a $5 million project. Duncan over at BikingToronto has a pretty good analysis/rant of the problem at this intersection, and I can’t say that I disagree with him. City staff has indicated to 29 Bikes a couple of times that they plan to connect this path to the Pottery Road path and the Lower Don trail, but the timeline has ranged from “maybe next year” to “it’s still in the conceptual stage.” In other words, I’m not holding my breath. But what makes the lack of connection particularly galling is that these two cycling projects, both undertaken at the same time, end less than 200 metres apart (only about 100 metres as the crow flies) and are separated by a wide, newly reconstructed road that could easily accommodate an extra stripe of paint along the sides and a couple of sharrows to safely direct cars and bikes across the bridges. I’m astonished that the two pieces of infrastructure were not connected. 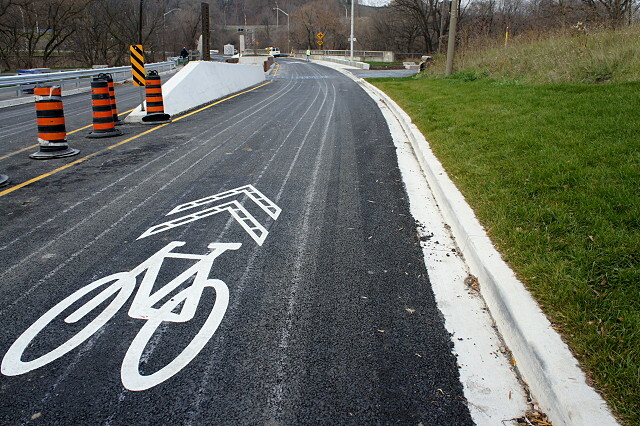 My other concern is with the sharrows in the downbound lane as they reach the Lower Don trail. If you look at the pciture below, a cyclist riding at this point who wants to turn onto the trail has to make a quick 90-degree turn to the left to go southbound or right to go north. The problem here is that cyclists will have to slow down considerably to make the turn in either direction, and there’s a good chance that a speeding car or two will be right behind them. I know from experience riding down Pottery Road for many years that car drivers do not like to brake once they hit the bottom of the hill. Most are still travelling quite quickly as they approach the bridge here and I’m not sure how well they’ll react to a cyclist in the middle of the lane slowing down to 20 km/h to make a turn off the road. 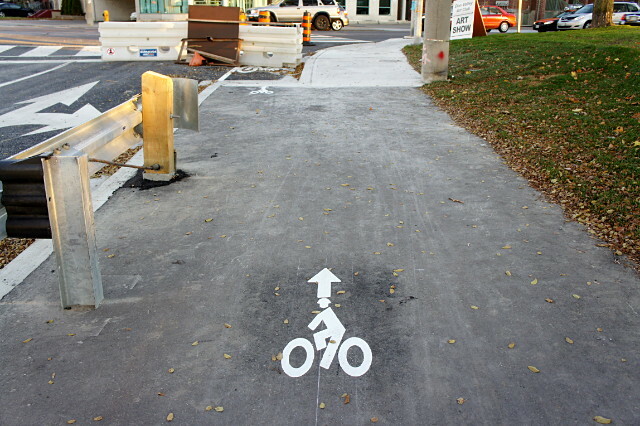 My sense is that most cyclists who are heading for the Don trail will just ride down the path on the side of the road. Only cyclists who are going straight through to the trailhead or Bayview will take the lane on the way down. 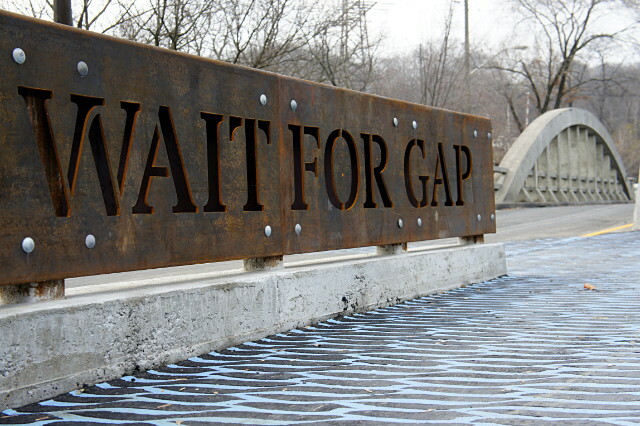 Which is kind of ironic, considering that the infrastructure ignores their needs past this point. As I said, I like what’s there, but it just doesn’t go far enough. I’m hoping that at the very least we can get sharrows across the bridges next year, and a dedicated cycling path linking up to Bayview shortly after. I understand that the current condition of the infrastructure here is temporary, but it could still stand to be fixed a bit to make it a little safer. It’s better than what was here before, but it could have been so much more without much additional effort. 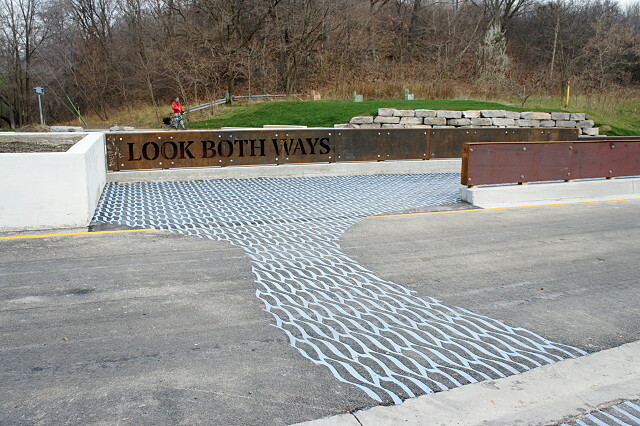 Pottery Road is the only road crossing on the central and lower Don trails from Edwards Gardens at Lawrence and Leslie Avenues all the way down to Lake Shore Boulevard. That’s remarkable if you think about it. Along the way, cyclists share park roadways and paths with motorists and pedestrians as they duck under other streets that are carried over the Don Valley by numerous bridges, ride both under and over various rail lines, and cross the Don River and its tributaries a dozen or more times. 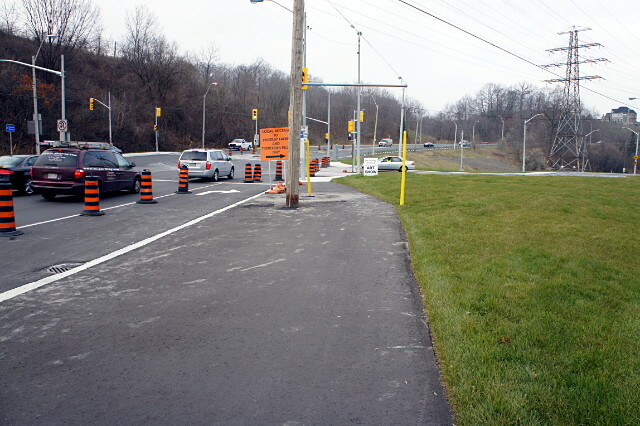 As the only road crossing, Pottery Road is worthy of a bit more than the bollard or cattle gate that Toronto typically uses to separate roads from trails. City staff have done an outstanding job of designing the crossing with both safety and aesthetics in mind. 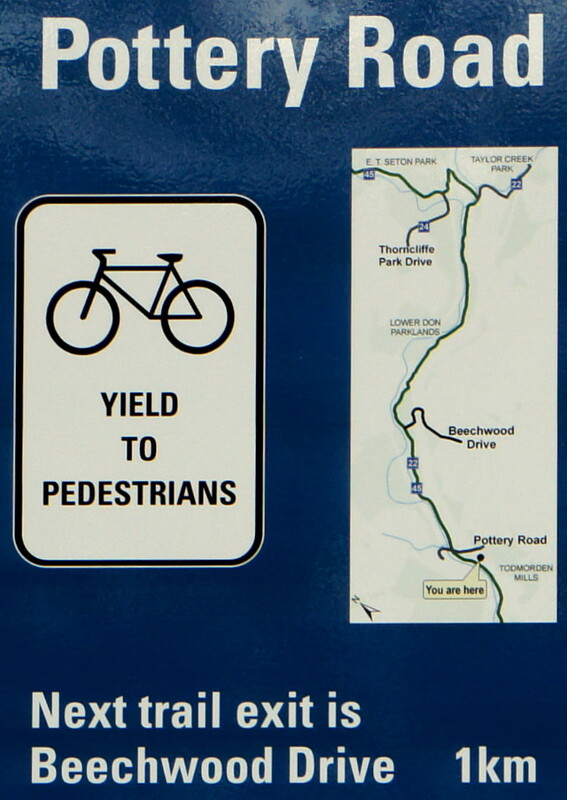 One of the most obvious features is the large upright steel “Pottery Road” sign that guards one end of the pedestrian and cyclist refuge between the two road lanes. The refuge itself has been upgraded and improved significantly. In the old refuge, cyclists would have to look backwards to see oncoming traffic, which was neither convenient nor safe. The new alignment reverses the flow through the refuge so that cyclists are now looking straight ahead to see oncoming traffic. It’s a small change that you don’t even really think about until the first time that you ride through the new refuge. I don’t have measurements, but the new refuge seems roomier than the old, giving more space for passing cyclists and pedestrians. Conspiciously missing from the paths that approach the refuge are any notices that cyclists must dismount. Given the lack of these signs on this and other recent projects, it looks like the city is finally taking cycling infrastructure design seriously instead of just assuming that everyone who is not in a car is always in the way of everyone who is in a car. This level of design is far above the typical Toronto Jersey barrier, which is so drearily common that it could go on our municipal flag. 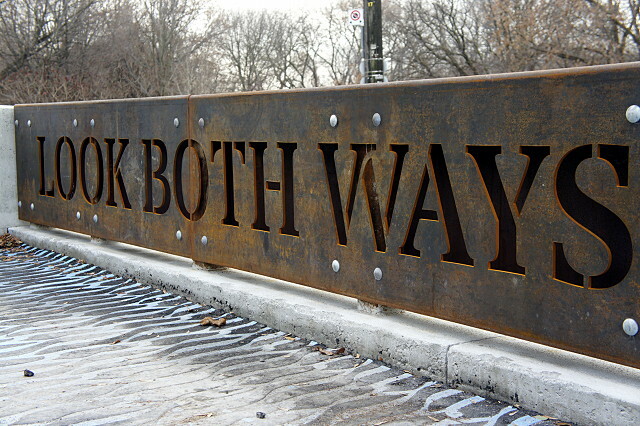 I thought it was curious that the rusty steel design here recalls neither the historic concrete bowstring bridge a few steps away nor the nearby Don Valley Brick Works and Todmorden Mills, but it works anyway and is suitably industrial to reflect the heritage of the sites. 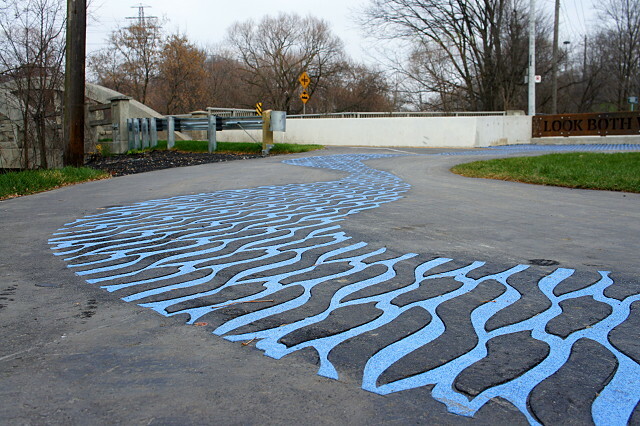 The pattern has been cut or laid directly into the asphalt and the colour looks like it’ll last. I’ll keep an eye on it for any fading. Also seen above is the rebuilt pathway north of Pottery Road. This had been a wide 2-lane road that connected Pottery Road to Beechwood Drive (I even remember my family driving on it once in my youth). In recent years, it was almost always gated closed and used only by trucks dumping loads at the snow dump beside the Don River, park vehicles, cyclists, and pedestrians. That snow dump was finally closed two years ago and is now called Cottonwood Flats (PDF). Since there’s no longer any need for heavy equipment to use the road, it’s been converted into a normal park pathway. If you ask me, the improvements on the Lower Don trail at Pottery Road alone are worth the inconvenience of closing the road for six months. 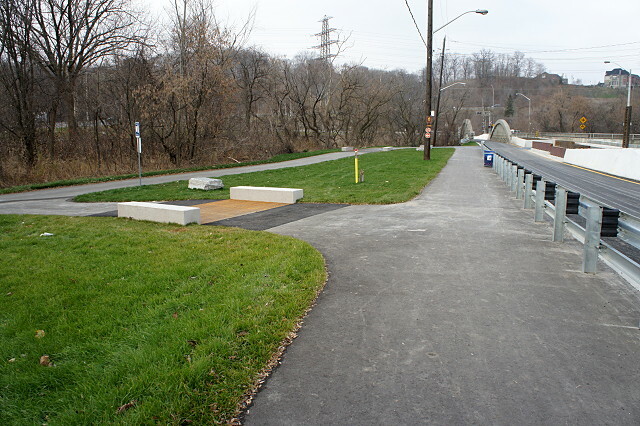 The work here shows a real understanding of cycling safety and an acknowledgement that the Lower Don trail is an important piece of infrastructure. I spend a lot of time looking at wayfinding signs. It’s not because I don’t know my way around, but because a lot of other people don’t. If I had a nickel for every time that I tried to explain to some lost soul on the Don Valley trails how to get to a particular destination or back out onto the street, I’d have at least $2.65. Unless you already know your way around Toronto’s ravine trails, you’re almost certainly going to get lost at least once the first time you try to get somewhere new. Name of road at current intersection? Check. Distance to next exit? Check. Map showing current location? Check. Map showing connections to other trails? Check. Map showing nearby destinations? Sorta-check. Although the map lists upcoming parks, shows route options, and names streets at egress points, it still doesn’t really show any attractions along the way. It does point the way to Todmorden Mills, which is just around the corner from this sign, but doesn’t show the Crothers’ Woods trails just on the other side of the river, the Brick Works a quick ride away down Bayview, or—most importantly—the Dairy Queen at the top of Pottery Road. The map could also orient cyclists in the larger street grid by showing the closest main streets, not just ones that cross the path. Also, the map curiously omits the access point at Don Mills Road that goes up to Flemingdon Park, even though it does show the access road into nearby Thorncliffe. The omission may be because the Don Mills access is more informal and you have to climb a very short staircase to get to it. The Toronto signs are less cluttered and present the information more clearly, but I think they could use a bit more detail. I look forward to seeing more of them along the trails. 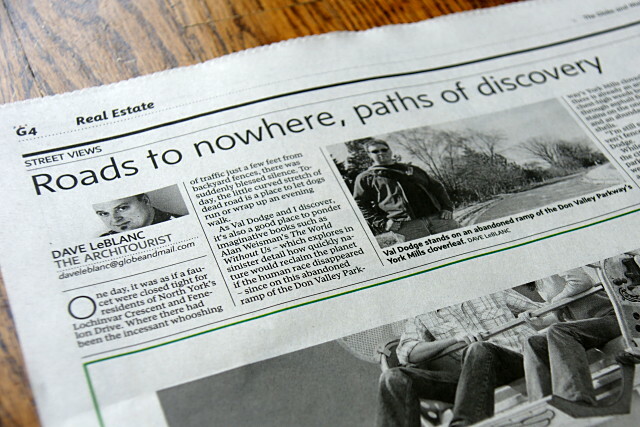 For those of you who didn’t catch it, Dodgeville was featured in Dave LeBlanc’s Architourist column in Friday’s Globe and Mail. Mr. LeBlanc (to use the Globe‘s house style) and I spent a sunny Sunday afternoon last month exploring three abandoned bits of Toronto infrastructure: old Don Mills Road, Pottery Road, and the DVP on-ramp at York Mills. Good times.